Is the Dry Bag a game changer? 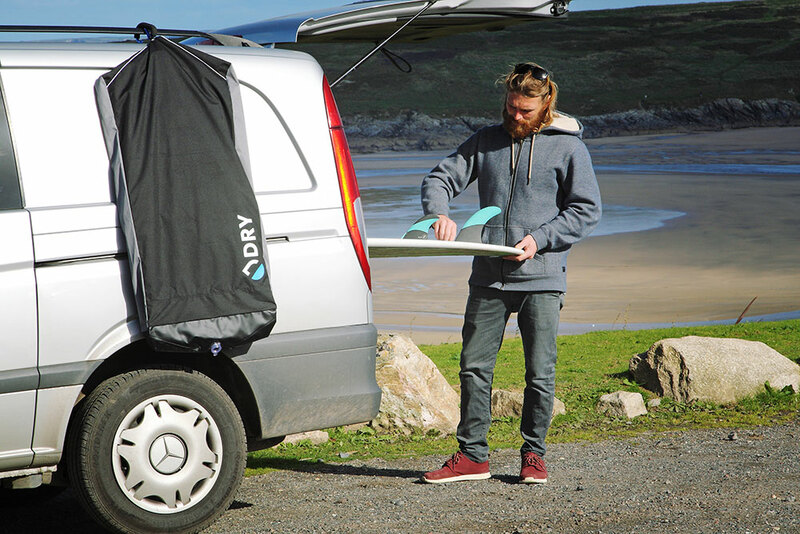 The Dry Bag was created after one crisp spring morning on the Cornish coast where Matt Deaves, a British surfing pro, once again plunged his dripping, sand smothered wetsuit into a bag, a bothersome daily occurrence that tainted the pleasure of the sport he lives for. Determined to find a solution, Matt started experimenting with different ideas, materials and designs until he stumbled upon a seemingly obvious idea – Dry Bag. The result was a wetsuit carrier that could be used to hang a drenched wetsuit, sodden board shorts or a wet rain coat. A strong hanger and water collection well in the base meant that the Dry Bag could hang from the roof of Matt’s car – his wetsuit dried on the drive home, and Dry Bag was created. You’ve spent years throwing wetsuits, wet coats and clothes into buckets, shopping bags and the lark. You then get home and have to wrestle with your wet garments, often getting soaked (again) in the process. For days your bathroom looks like a laundry room and it’s a struggle to shower or take a bath without getting your wetsuit damp again. You can’t hang your wetsuit outside in direct sunlight for fear of UV rays damaging your suit, it takes days to dry in the shade and wherever you hang it you’re left with a puddle of water – far from ideal. The Dry Bag is a full length zip up bag that protects your wetsuits and wet garments from direct sunlight whilst letting them drip dry efficiently yet naturally. Mesh vents enhance airflow and a water reservoir collects the residual water – no puddles here! We know you’re not a fair weather athlete and that your sport is the most breathtaking, awe inspiring sport in the world. That’s why we’re here for you so water and the elements of the outside world never stop you from making strides in pursuit of greatness. This innovative piece of kit has been designed with you in mind, it is guaranteed to make your life easier and allow you to focus on the important aspects of your sport. Keep a clear mind, keep your kit dry.